Esci da Strasburgo per la giornata e visita alcuni villaggi affascinanti e incantevoli in questo tour privato a tema guidato dal vino. 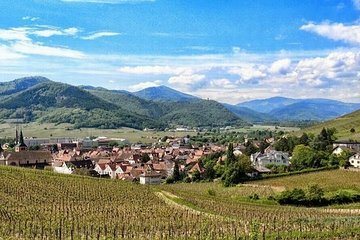 Fermati nei villaggi di Riquewihr, Colmar e Eguisheim e poi partecipa a un tour e degustazione di vini nel Castello di Haut Koenigsbourg. Sedetevi in un ristorante locale e concedetevi un pranzo di tre portate (a vostre spese). My wife and I had an amazing tour in Alsace starting from Strasbourg. Our tour guide, Pieter, was great, super-friendly, and knowledgeable about Alsace and Alsatian wine. The tour was the perfect mix of sightseeing and wine. We toured Chateau Haut Koenigsbourg, Riquewihr, Colmar, and Eguisheim. It was definitely worth it. You won't be disappointed. Me and my dad took this tour in November and it was absolutely amazing! The tour combines the perfect amount of sightseeing and wine tasting, and Peter was a great guide. The entire region was beautiful and it was definitely one of the highlights of our trip to France. Peter, our guide was great, he is very knowledgeable about the area. Part of the tour was to a wine factory, Peter made the experience, one worth remembering and his knowledge of wine is extensive. A tour worth taking and insisting on Peter as your guide.